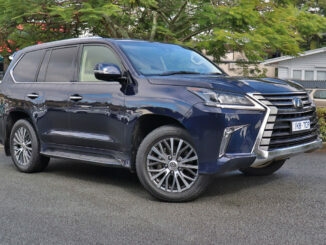 What a FANTASTIC seven-seater SUV!! 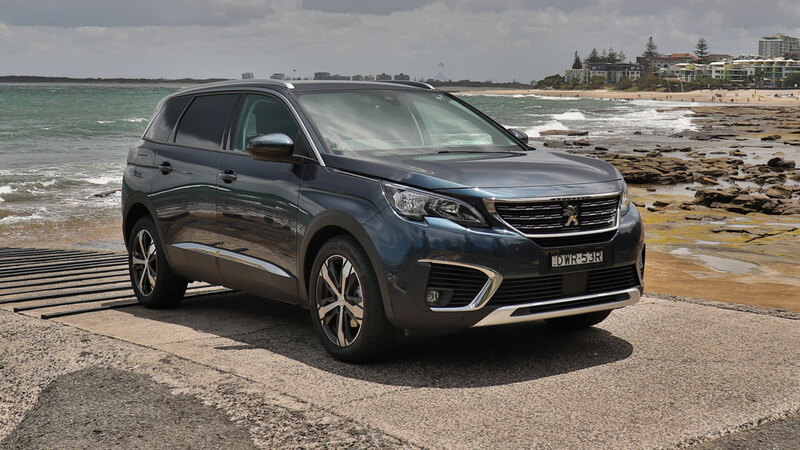 The Peugeot 5008 is a contender in the seven-seater category along with the likes of the VW Tiguan Allspace and the Mazda CX-8. Let's see how it fared in our BabyDrive testing!! Well… can I just start by declaring my love for the 5008!! I will admit that the first days driving everything felt unfamiliar and just different to all other cars I have driven recently, but not in a bad way! The steering wheel is smaller, different shaped and sits lower down, which gave me a clear view of the head-up display and a really relaxed driving position for my arms. The central console and dash wrap around the driver like you would find in a much more expensive model such as a Jaguar. The media screen is controlled with a line of matte silver paddles which took me a day or two to navigate and then I found simple. 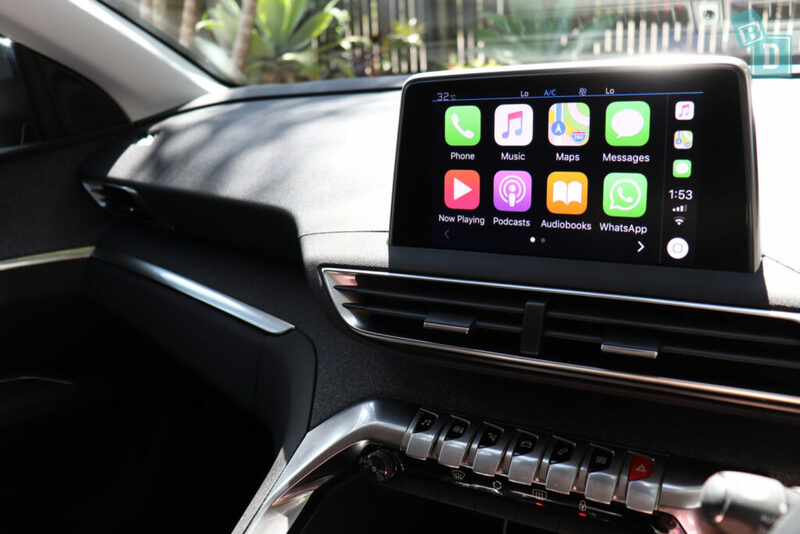 It has Apple CarPlay and Android Auto too. The seats are very stylishly upholstered in woven houndstooth fabric, which is also used on the dash and door panels, bot only the edges of the seats are trimmed with pleather and, I'll be honest, as much as I enjoyed the beautiful interior I was VERY nervous of our daughter eating, drinking or doing anything in the car! The reversing camera image at first seemed computer generated as it's so clear, and although I found it different at first I loved the various camera view angles available, especially the bird's eye view that made parking so easy because I could see my position in the lines (in the image below and in the video review there's a black box around the car in the image as I had a door open at the time). The 5008 felt really solid on the road and was great to drive, it has a lot of grunt and really sticks to the road. It was a HOT week when I had the 5008 for testing and I found the air-con fan was very loud when I had it on full blast to cool down the cab. The second-row seats in the 5008 all slide and move independently. 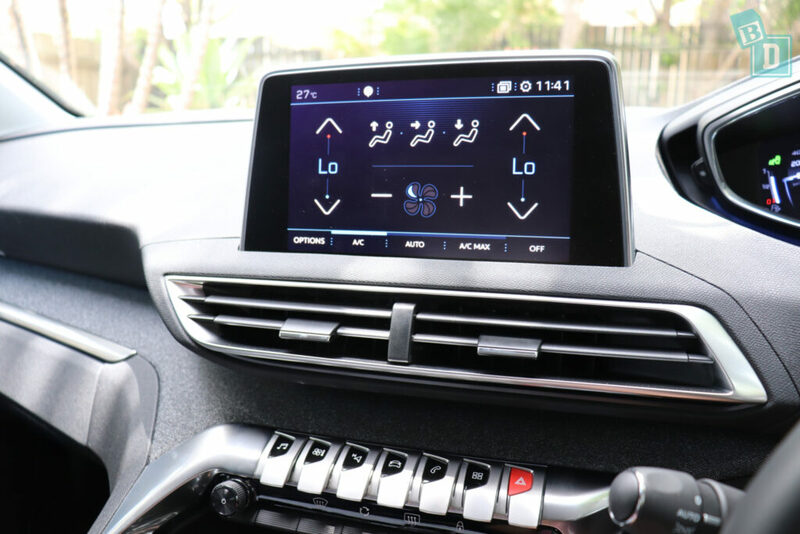 There are top tethers for each one, all of which are clearly labelled in plastic guides on the back of each backrest, AND there is also ISOFix in the seat base of ALL THREE second-row seats, which is fantastic! I found I could fit three child seats across the second row. I did have to remove the headrests for the forward-facing child seats, so that they sat properly. The third-row seats had a slightly different method of folding up and down that I hadn't seen before, in terms of how they come in and out of the boot floor. Their mechanism was nice and light and simple to use and I could sit comfortably sit in the third-row seats (I'm 162cm) with enough headroom and leg-room behind a rear-facing child seat AND there be enough legroom for me to sit in the driver's seat in front of that! 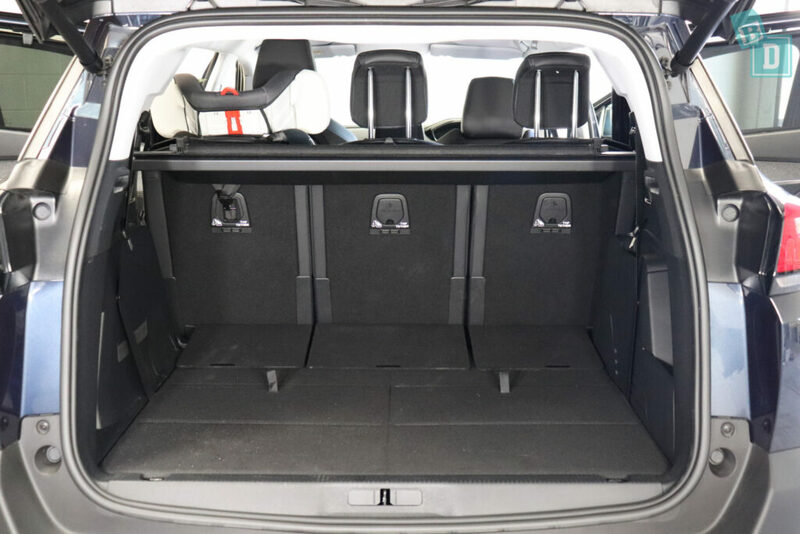 However, I don't think there is enough space for a 180cm passenger in the first and third rows with a rear-facing child seat in the second-row. The front passenger seat folds down completely flat which makes it much easier to climb through to the central seat, or to reach through to the back to do up seat belts and harnesses. Although the second-row seats slide forward, with child seats installed in the outer positions of the second row there is still not enough room for someone to squeeze through the gap. I found you would need to uninstall a child seat in order to access the third-row seats. There are no top tethers or ISOFix in the third-row seats, so I didn't fit any in there, and I believe the 5008 is more of a great five-seater with a generously sized boot and the option of carrying more friends or family when needed, but probably not every day! 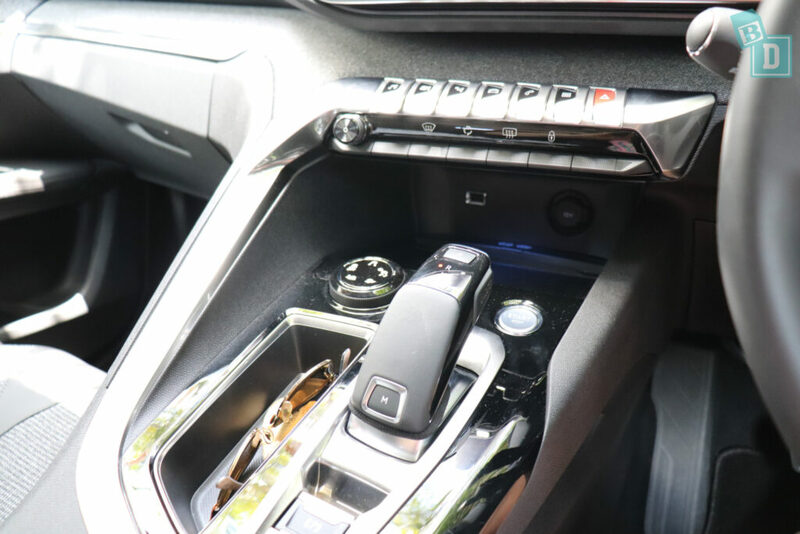 The Peugeot 5008 is full of great features, like the child lock button on the front dashboard. The second-row windows have built-in sun blinds which I think are just the best feature! Just when you thought it couldn't get any better there are also fold down tray tables in the back of both front seats, we found that our daughter in her child seat couldn't reach to use the tray tables as she sat too hight but the passengers that weren't in child seats could use them easily. 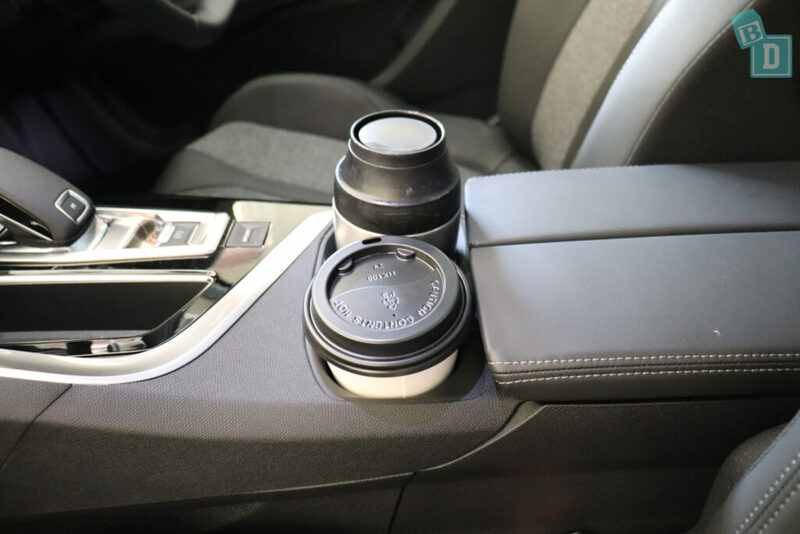 Storage was quite minimal in the 5008, in the front, there are two cup holders good for disposable and reusable coffee cups, the front door bins could hold a large refillable water bottle. 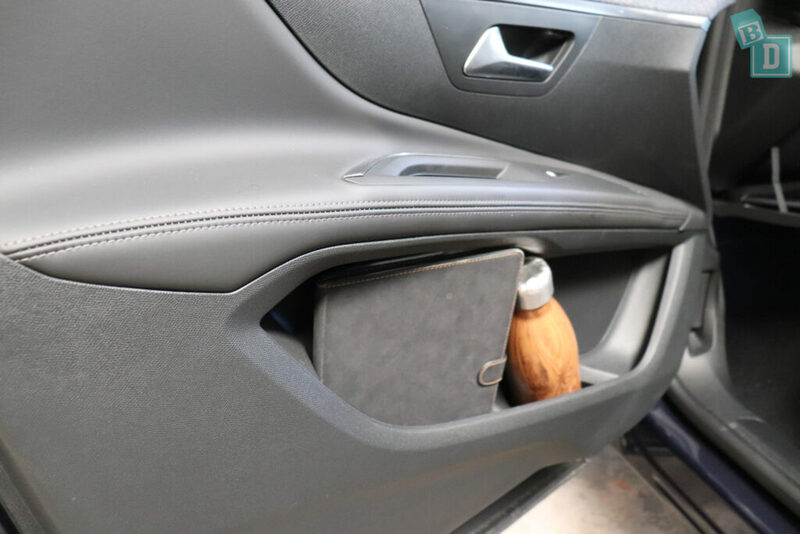 A wireless phone charging tray in front of the gear lever and there was a space for a wine bottle in the central console box! No sunglasses holder though and the glove box was small, only room for my wallet with the manual. In the second row, there are just the small door bins and two net map pockets and the third row just has a cup holder on one side. 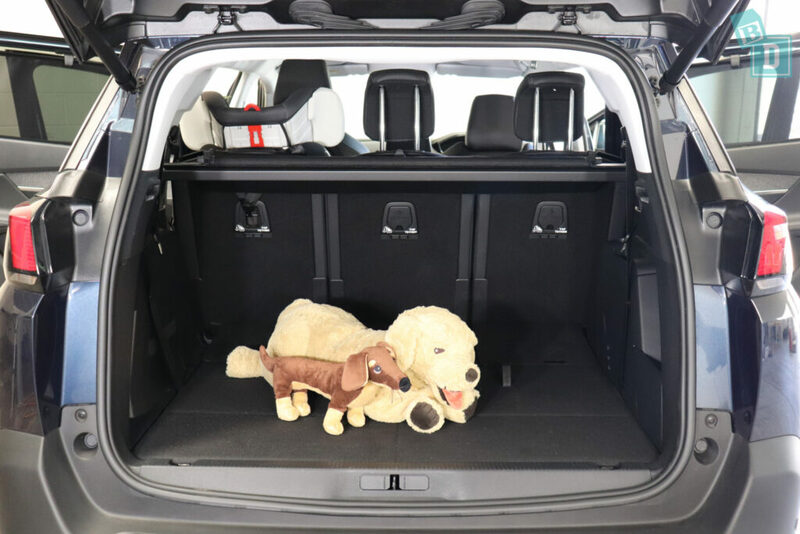 The boot of the 5008 as a five-seater has very good storage space and it held all three Mountain Buggy strollers and the Britax tandem stroller with differing amounts of shopping bags alongside them. 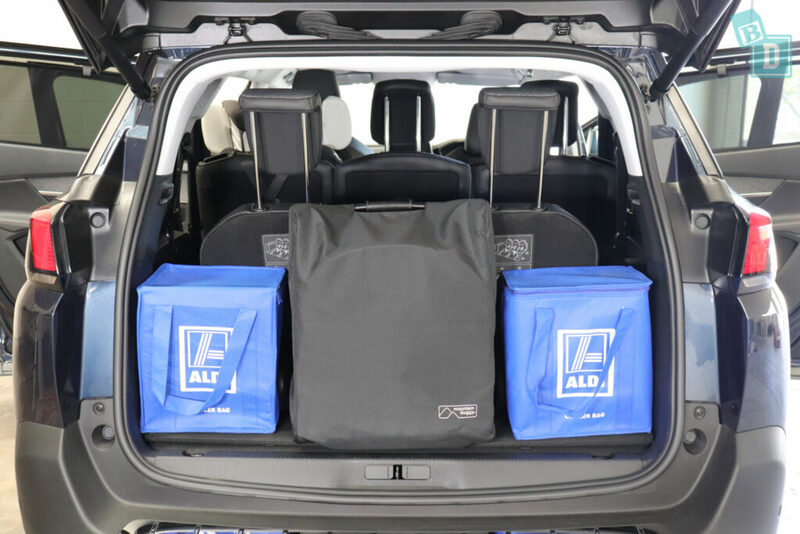 When using all seven seats the boot space is tiny and I could only fit four shopping bags or the Mountain Buggy Nano compact stroller was the only stroller I could fit with a couple of shopping bags. When using only five seats the boot floor was nice and flat, suitable for an emergency nappy change! When using all seven seats there was definitely not enough room. 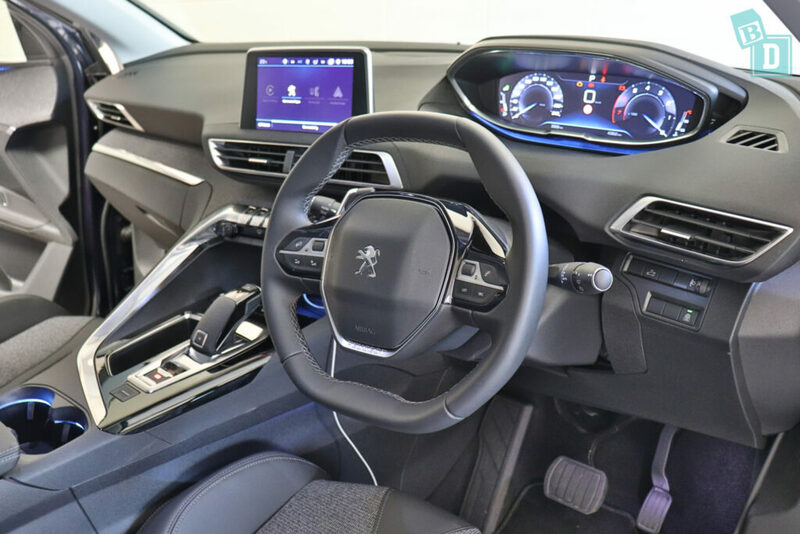 The Peugeot 5008 scored a five-star ANCAP safety rating in 2016 and has six airbags as standard, dual frontal and side chest airbags and curtain head airbags for the second and third-row passengers. As well as seatbelt reminders for all three rows of seats. 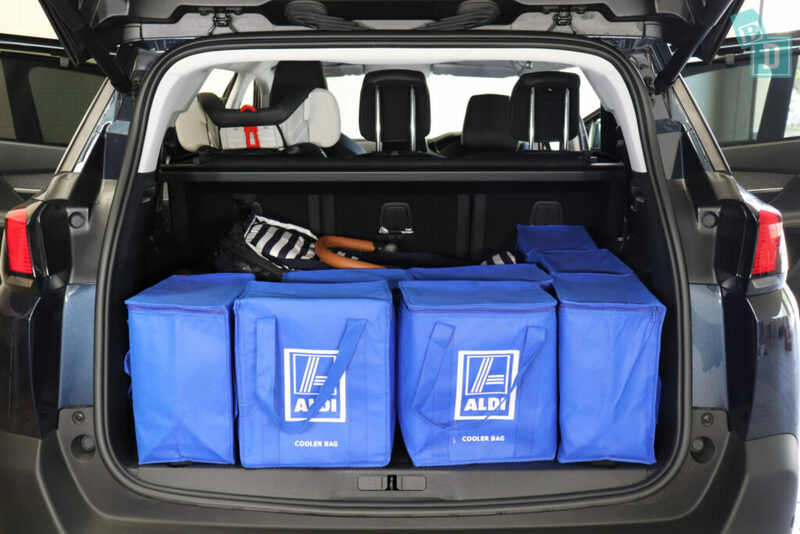 So… How big is the boot of the Peugeot 5008? 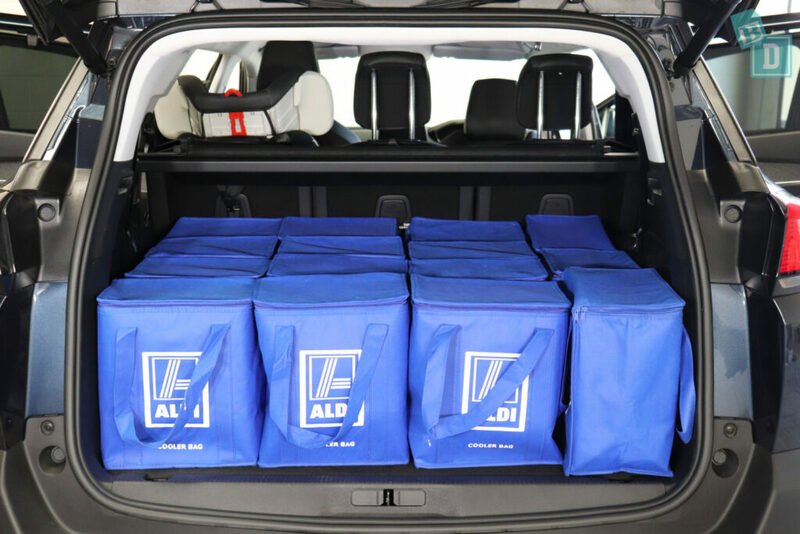 When only using five seats, I could fit 15 shopping bags in the boot of the Peugeot 5008. 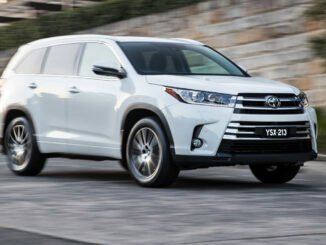 That is the same as the VW Tiguan Allspace and two less than the Mazda CX-8. I measure the boot space in freezer shopping bags, prams and dogs. Not because I think all there is to a mum’s life is food shopping, prams and dogs. (Although it can feel like it sometimes!!) But because these are visually mesurable items we can all associate with. 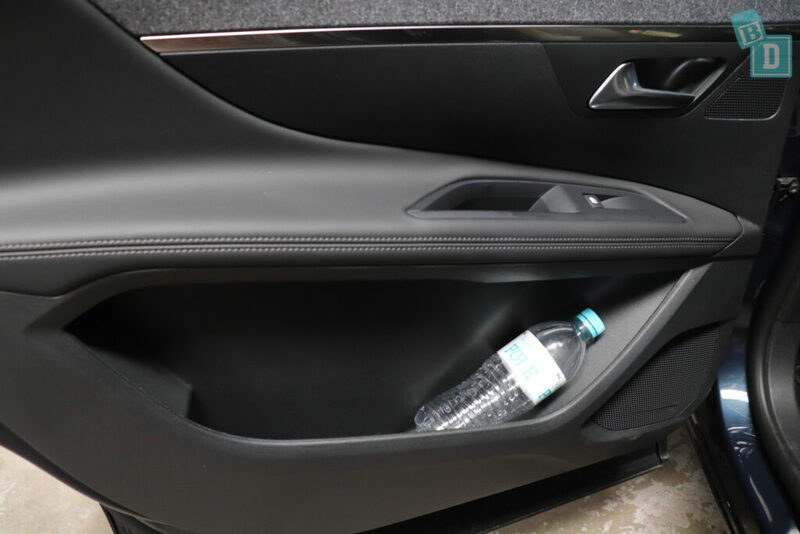 For me, the car company boot measurement of litres is not an amount I can easily visualise and 400L in one car may differ in usability to that in another due to the configuration or shape of the space. The Mountain Buggy Duet twin stroller fitted with six shopping bags beside it, matching the Mazda CX-8 and one more than the VW Tiguan Allspace. The Britax Flexx tandem stroller fitted with eight shopping bags beside it. The Mountain Buggy Urban Jungle single stroller fitted with eight shopping bags beside it. The Mountain Buggy Nano compact stroller fitted upright in the boot with 13 shopping bags beside it. Or you could fit a medium sized dog in there! 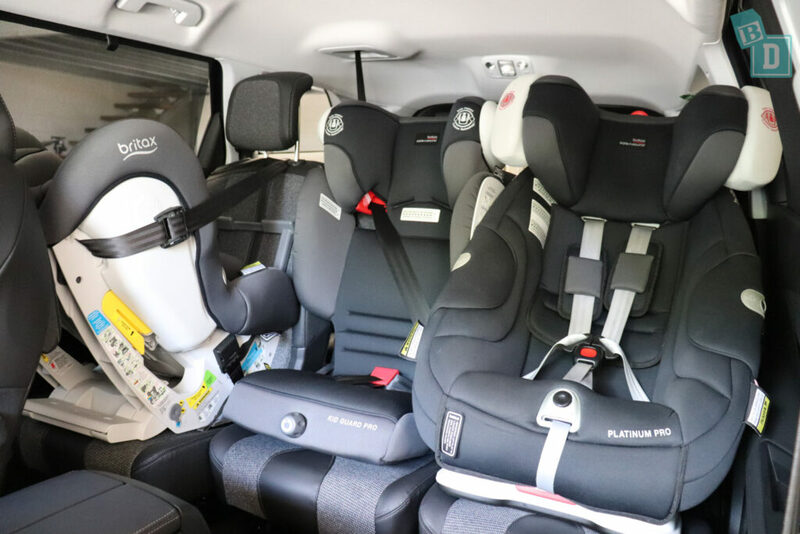 When using all seven seats the boot space is very minimal, with definitely no room for an emergency nappy change! I could fit four shopping bags in there though. Or the Mountain Buggy Nano stroller fitted with two shopping bags. 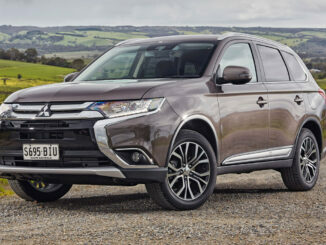 One less than the VW Tiguan Allspace and two less than the Mazda CX-8. 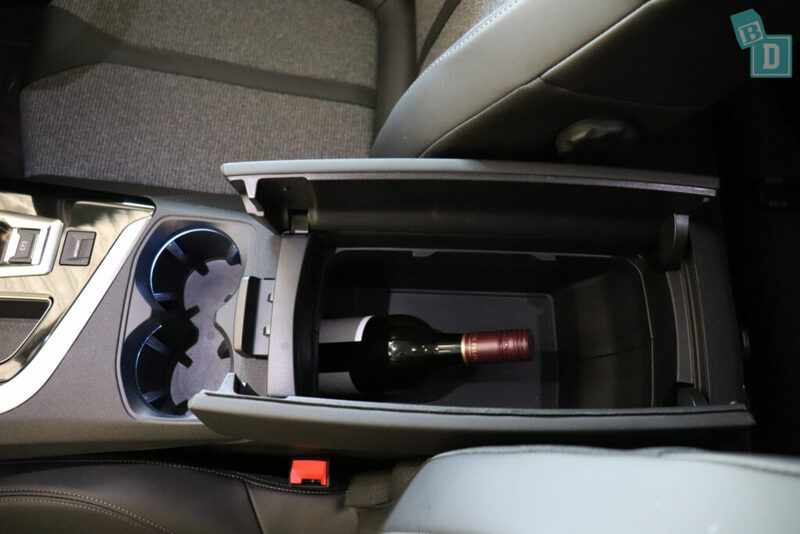 Storage in the cabin of the 5008 was minimal but there are some great family friendly features! In the front there are two cup holders in the central console, they both fit a reusable or disposable coffee cup well. In front of them is a small storage well I found useful for sunglasses as there is not a case in the ceiling. 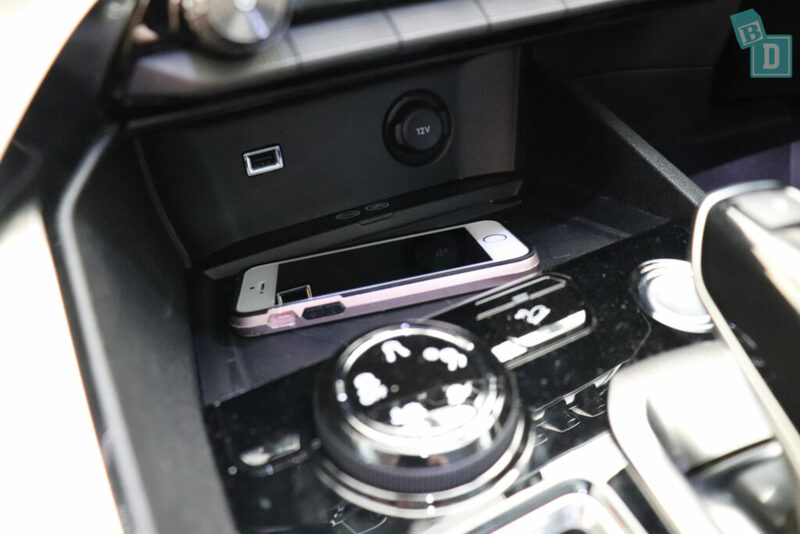 In front of the gear lever is a wireless phone charging area with 12V and USB socket also. 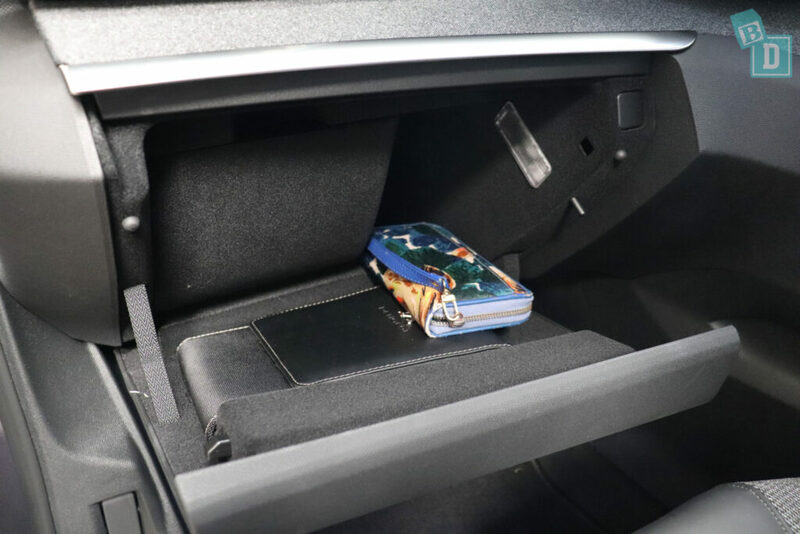 The glove box is nicely lined but quite small, so it would only hold my wallet along with the manual. The door bins in the front will hold a large refillable water bottle and an iPad fits well in them too. 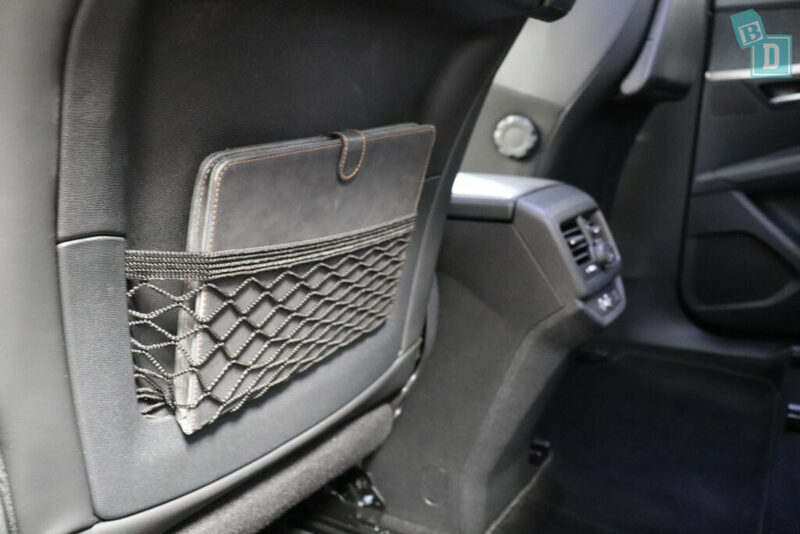 On the back of the 5008's front seats, there are net map pockets that will hold an iPad but not conceal it. Above both the map pockets are fold-down tray tables which are fantastic! I found my little girl couldn't reach them when she was up in her child seat, but other passengers enjoyed using them and she used them when we stopped on a long journey for a picnic! The door bins in the back are not as big as in the front but they will hold a 600ml water bottle. Also in that second row, there are built-in shades on the windows which is another great family feature. I find myself so much more relaxed when there are windpw shades in a car because I know my daughter is shaded from the sun no matter which way I turn or drive that I don't need to worry about it. So many times on journeys we have constructed ridiculous shades out of cloths or towelsand trying to shut them in the window while hubby's driving along, or tying my jumper around one handle in the ceiling and across to another!! I am told there is also underfloor storage in the second-row footwell which I am sad to say I didn't notice for my video review. 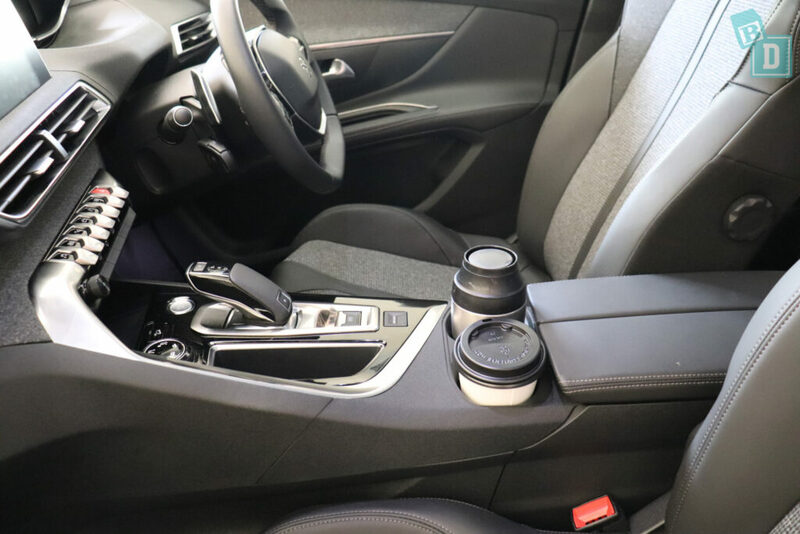 In the third row, there is a single cup holder on the right-hand side and a small shelf area on both sides for the rear passengers. So… How noisy is the Peugeot 5008? The 5008 wasn't too noisy a car. The media screen is large and clear, and once I'd eventually worked out that the silver paddles below it are used to go between screens, it was easy to use. It does have Apple CarPlay and Android Auto which is great and I found the Bluetooth good too. Visibility isn't amazing out of the 5008, so I found the good cameras really helpful! 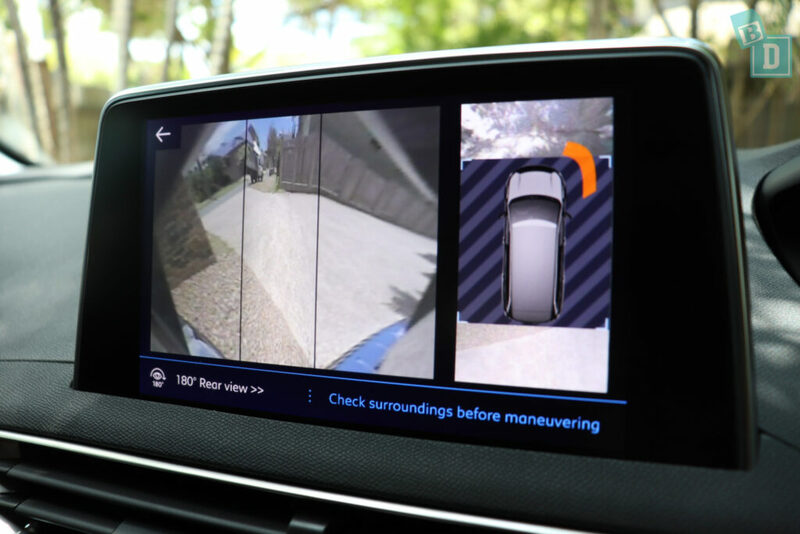 The reversing camera has a great image that is so clear it almost looks computer generated. You can move between camera angles and I found the birdseye view soooo helpful when parking (in the image below and the video the blacked-out area is because I had a door open). The 5008 has lane departure and blind spot warning too. The indicators are loud in the 5008, enough to make me want to avoid changing lanes unless I really had to when bub was asleep. 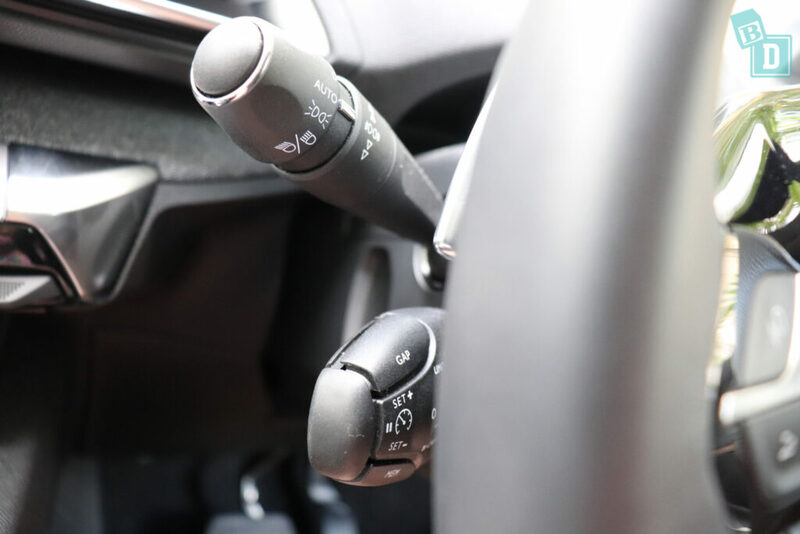 I found the cruise control stalk was very closely tucked behind the steering wheel, so you have to alter it without being able to see what you are doing, which is probably fine after a month but when it's a new car I found I couldn't see to alter it very easily while driving. 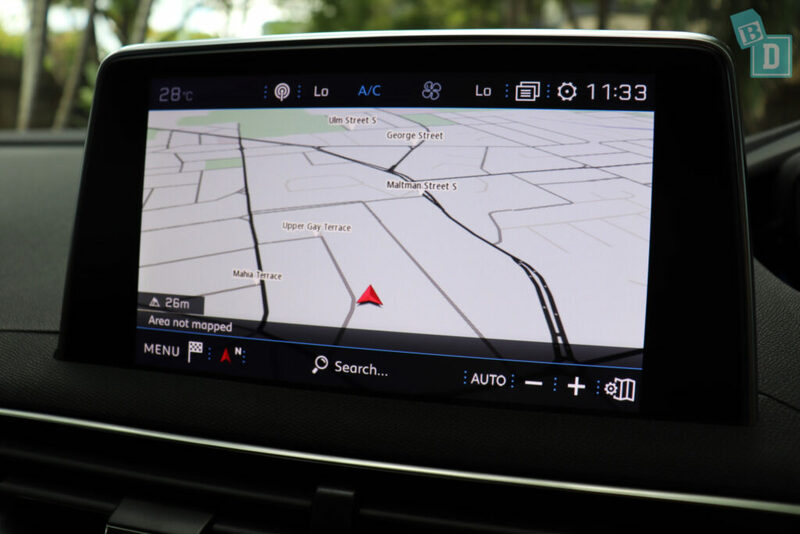 The Sat-Nav is quite easy to use and programme in your destination. I didn't find a simple way to mute the voice guidance, as you have to go in through a couple of menu screens to do it, which isn't easy to do while driving. Once you have set it as silent then, of course, it stays like that but it woud be helpful to be able to turn it on and off with a simple button. I find on most journeys when I use sat nav I only need directions for the last part of the journey. I know how to get to the area I am going and then it’s just the exact address I need help with. Because I need to input the address before I head off I found myself on most occasions when you can’t mute the sat nav voice having to listen to all the directions, which disturbs your concentration, any conversation in the car at the time or more importantly my sleeping baby! So being able to mute the sat nav voice until you reach the part where you actually need it is gold! 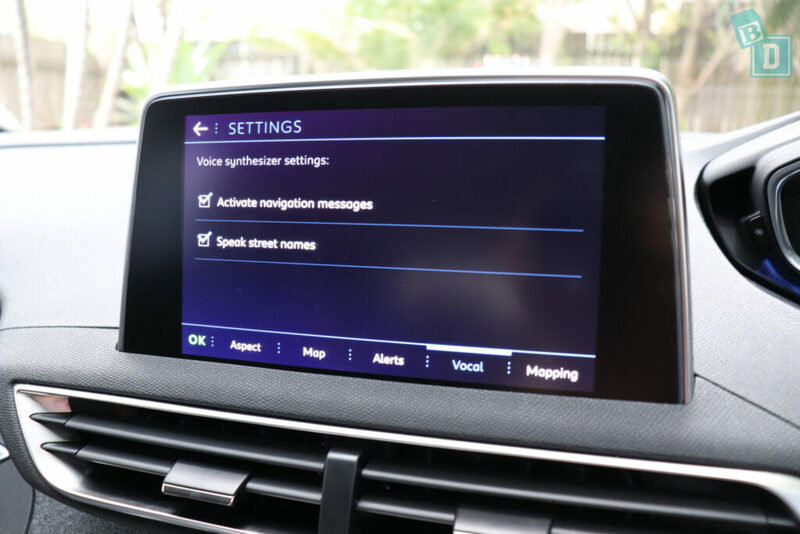 You can bring up the directions in your head-up screen, using the controls on the steering wheel, which I find really useful when you have set the navigation guidance to silent. The windows of the 5008 are pretty loud to open and close and I'd probably use them minimally if my bub was asleep in the back. The doors, however, are nice and quiet. I found you can come to a stop with the engine still running and get out of the car without sounding any alarms. Since becoming a mum I spend A LOT of time parked up somewhere with a nice view while my daughter is asleep in the back! If it's hot I need to leave the engine running and the aircon on but I do like to get out and drink my cuppa tea in the fresh air while enjoying the fact my limbs are free from said dangling child!! 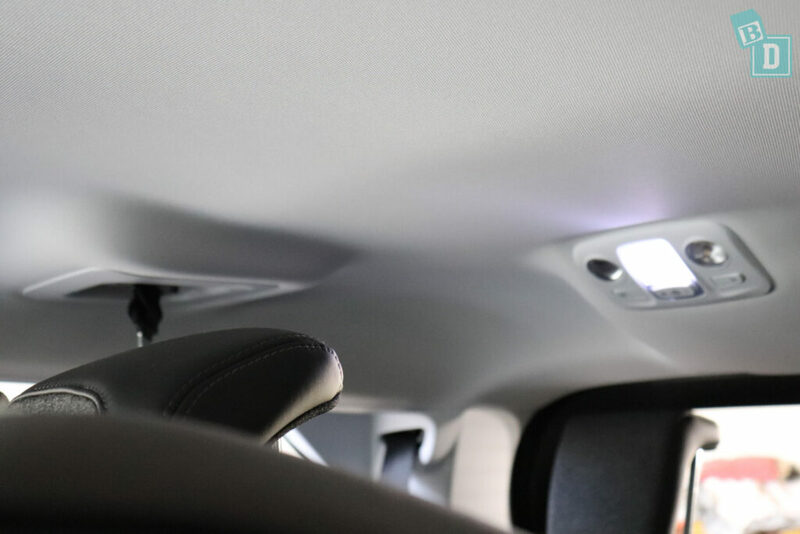 The seatbelt removal alarm sounds and a light alerts you on a panel in the ceiling too, and there are sensors for all three rows of seats which s fantastic. If you open the driver's door when you are not in Park, then there is the craziest siren of a noise that blares out! I simply did it when my skirt was trapped in the door and WOW!! What a noise! That is definitely going to alert you and everyone else that the door is open and wake any little ones asleep! The air-con in the 5008 is pretty loud! I did seem to have the car in the hottest week of the year so far so I was using a lot of highest setting air-con and I did find it very loud! Road and engine noise are really quiet in the Peugeot 5008, so neither was a problem. 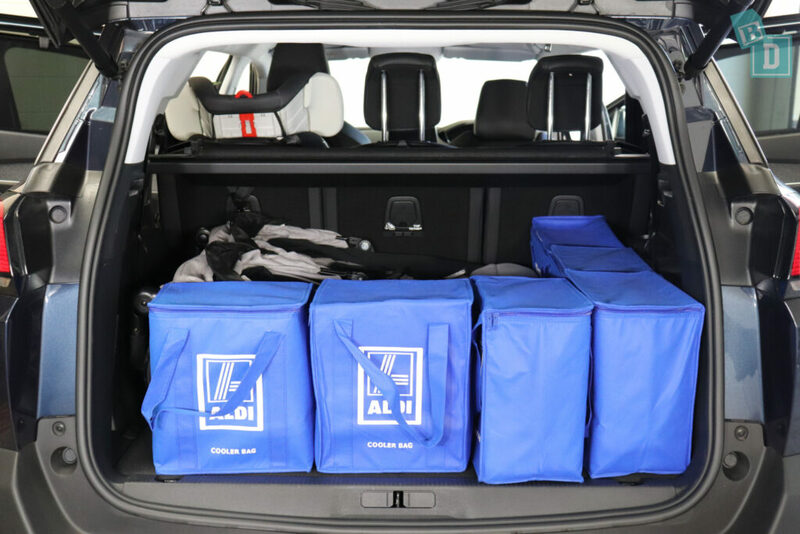 So… How many child seats fit in the Peugeot 5008? 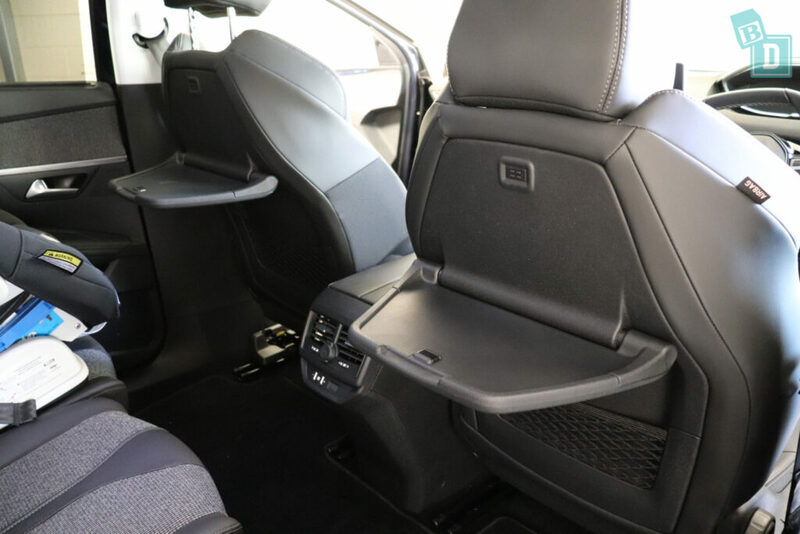 The Peugeot 5008 is a seven-seater SUV with three top tether points across the second-row seat backrests that are clearly labelled and within plastic guides, making them nice and easy to connect to. The second row has is three individual seats, all of which have ISOFix and move and slide independently, which is fantastic! The ISOFix are not within plastic guides, but are clearly labelled and easy to connect to. I was able to fit three child seats into the second row of the 5008. I tried a few combinations and found three forward-facing seats would fit next to each other, which is a fantastic amount of space. I could also fit two forward-facing seats (Britax Platinum Pro and Kid Guard Pro) with the rear-facing Britax Graphene. However, I did have to remove the headrests for both forward-facing child seats in order to stop them being pushed forwards. 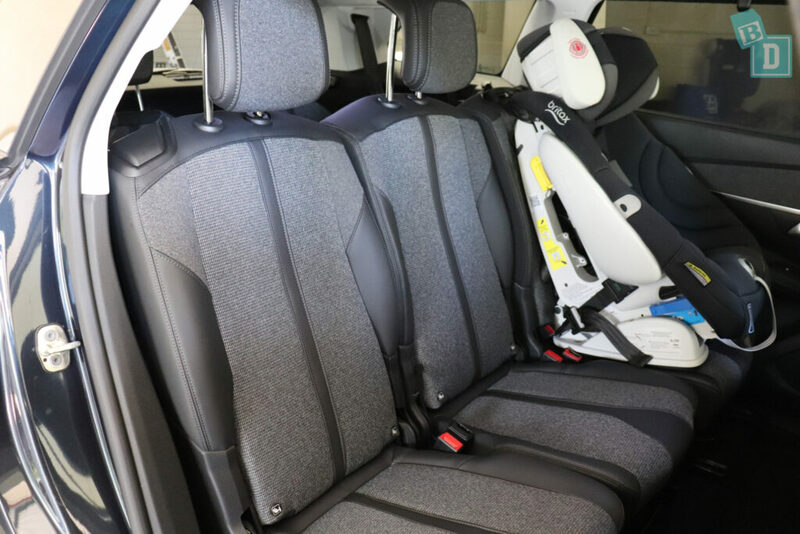 The front passenger seat folds flat so kids can climb through to access the second-row central seat, which also makes it easier for adults to lean through and do up child seat harnesses. Although the seats slide independently, I still found there was not enough space for a passenger to squeeze through to the third-row seats, even when the outer seats were set all the way forward. You would have to remove a child seat to climb through. I found that when using all three rows, with a rear-facing child seat installed in the outer second-row seat, that there was enough room for me to both sit behind it in the third row and in front of it in the driver's seat (I'm 162cm). With a rear-facing child seat in an outer second-row seat that is in it's furthest back position, then a 162cm driver can sit in front of it, I found there was not enough room behind that for me to sit in the third-row as there just wasn't the legroom. 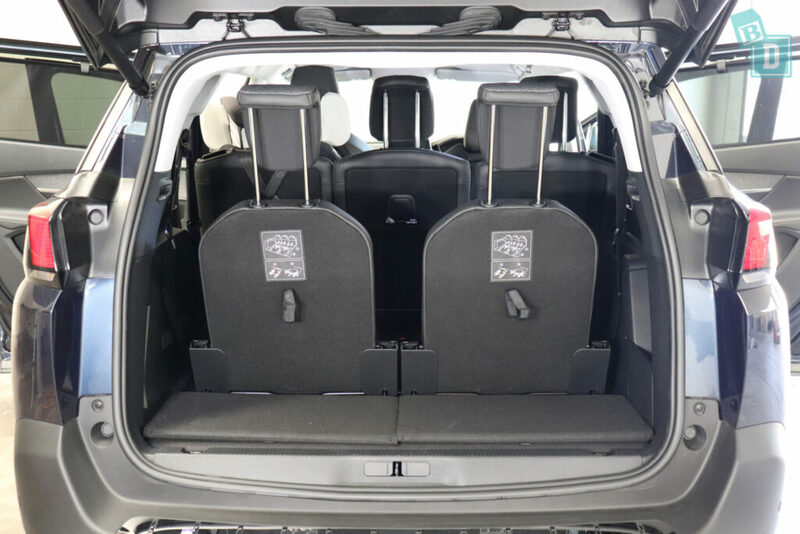 The third-row seats pop up and down quite easily out of the boot floor, which concertinas back to cover the little remaining area. The seats are nice and light to maneuver, they are comfortable and have ample headroom for me at 162cm. Posting bub into their child seat from inside and outside the car is really nice and easy in the 5008. Being an SUV the ceiling is quite high, making it easy from inside and there are lovely big open doorways that give you plenty of room for posting bub in from outside too. Australia being a country of weather extremes; blazing sun and torrential rain, mean you may find it easier to put Bub into their seat from inside the car sometimes. 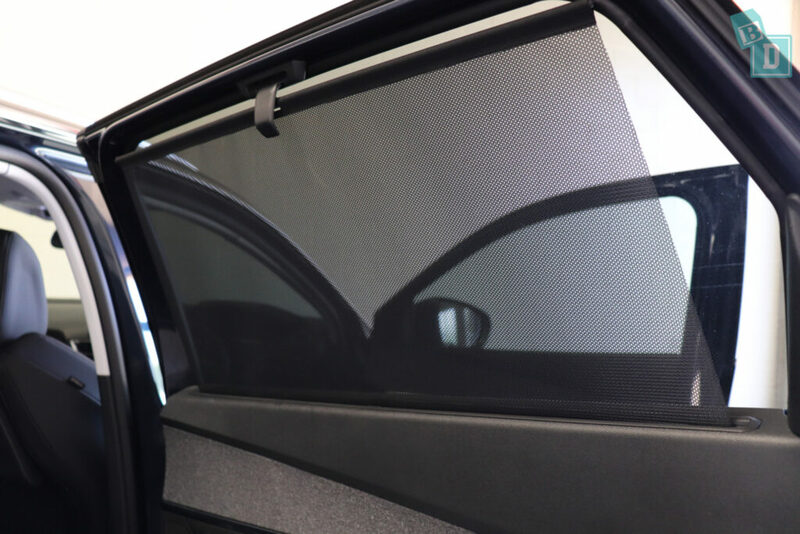 If it’s hot you can get the air-con going, cool the car down and not stand out in the sun while you fasten them in or shelter from the rain and not get soaked yourself whilst you’re doing it. So it is important to test whether Bub can be easily installed from either direction! There is room to feed bub in the second row, if you only have one child seat installed. 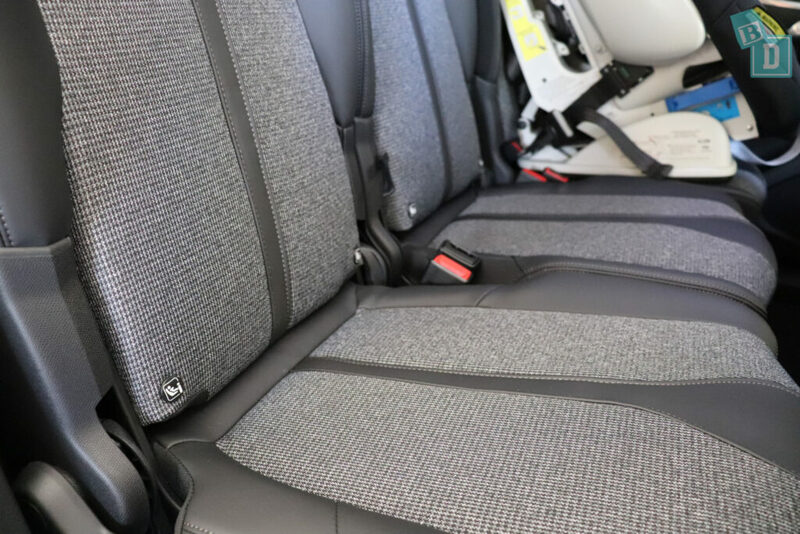 The seats are upholstered with houndstooth woven fabric with a pleather trim which would be a responsibility to keep clean and tidy but you would SO want to because it looks beautiful! 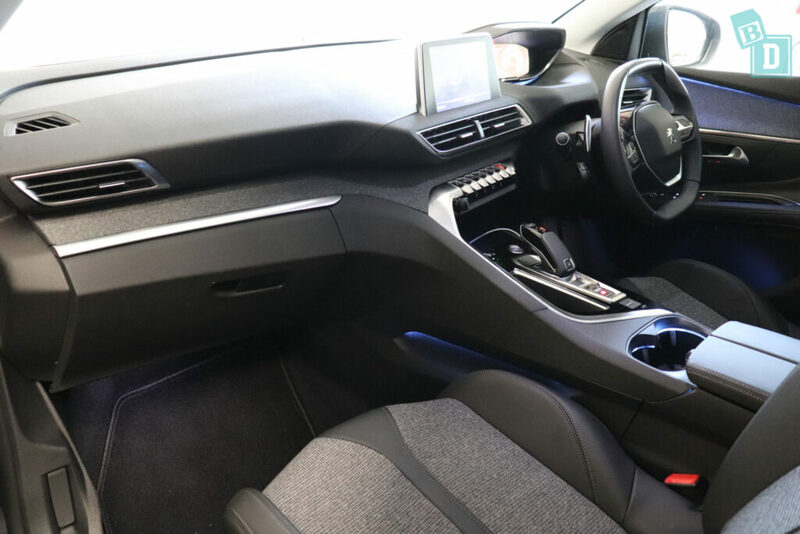 So… How comfortable is the Peugeot 5008? And How good is the Peugeot 5008 to drive? In the front of the 5008, the seats are really nice and comfortable, they are very sculpted and go with the whole tailored look and feel of the interior. They definitely hug your sides and you'd notice if you put on a few pounds quite quickly! The seat base is a good length (I'm 162cm) and doesn't press into the back of my legs. The seats are manually adjustable. AND I found can have a ponytail in the front seat which is fantastic! 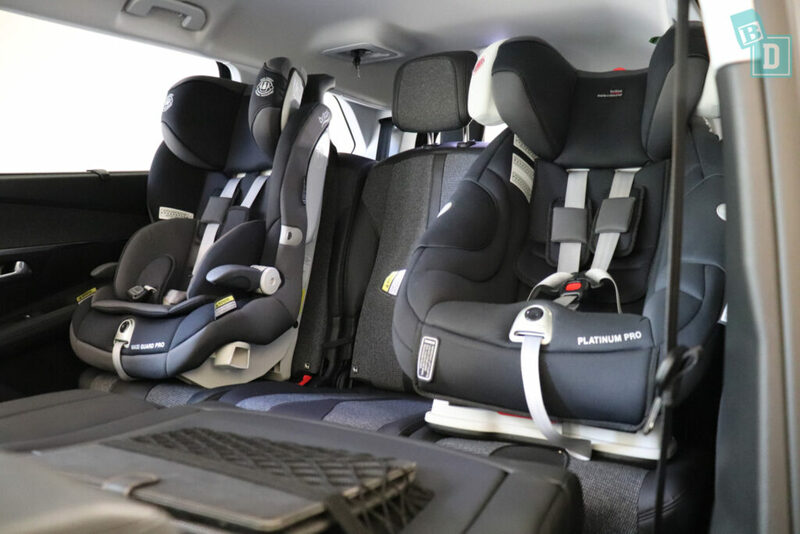 For a mum travelling in the back with bub, all the seats are very comfortable and there is ample room to comfortably sit in the central position between two child seats. For the first year of Tulsi’s life when we would go out as a family, if I wasn’t driving, I would travel in the back with Tulsi so it’s important to check the back seat comfort as you may be spending a lot of time in them! They were never something I gave any thought to before but I definitely notice a good or bad back seat now! The steering wheel in the 5008 is a slightly different shape and smaller than usual steering wheels. 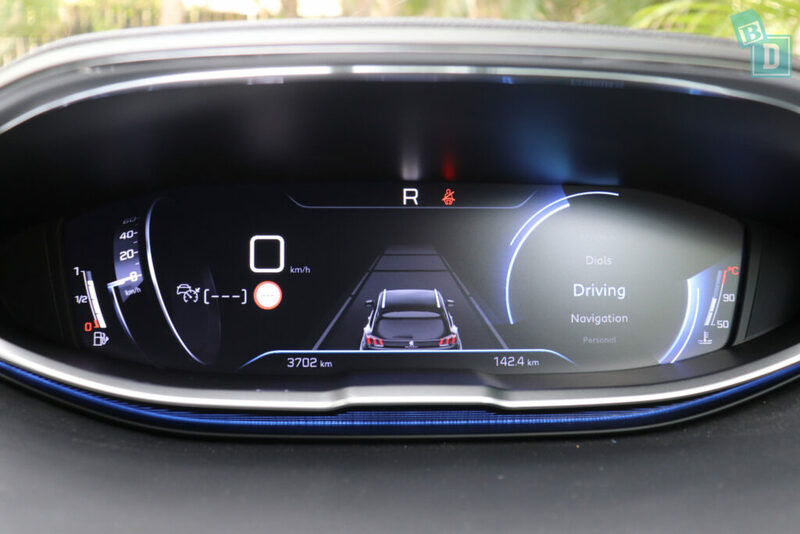 It is fully adjustable in/out and up/down but it actually sits lower than in most other cars, so the head-up display sits separately. It took me a day or two to get used to and then I loved this new position for the wheel, I found it much more relaxing for my arms while driving. There are four air-conditioning vents across the front dashboard; two central ones and one at either end. They are controlled through the media screen and although the airflow is very loud it does provide a good cool cab, and once it's cooled you can put it on the lowest setting to keep it ambient. 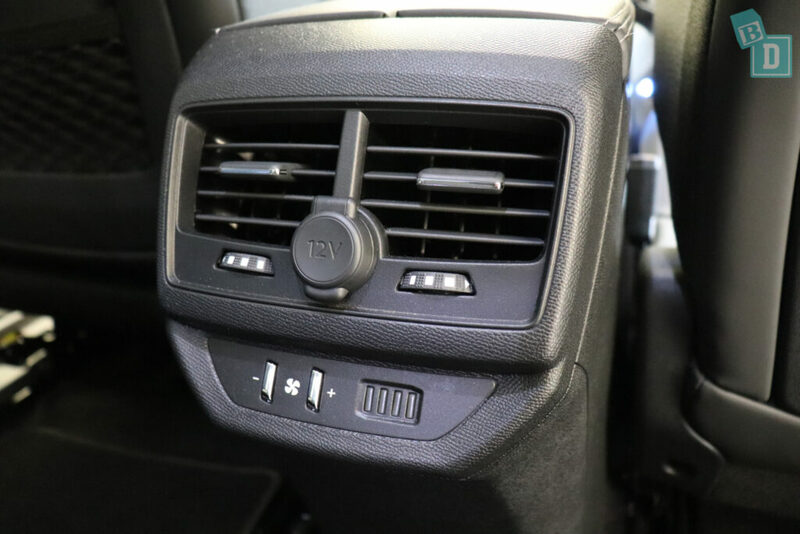 There are rear air vents in the back of the central console box, with their own fan speed, airflow and direction controls. All are reachable from the front while driving. There is also a 12V socket between them. There are no air vents for the third-row passengers. 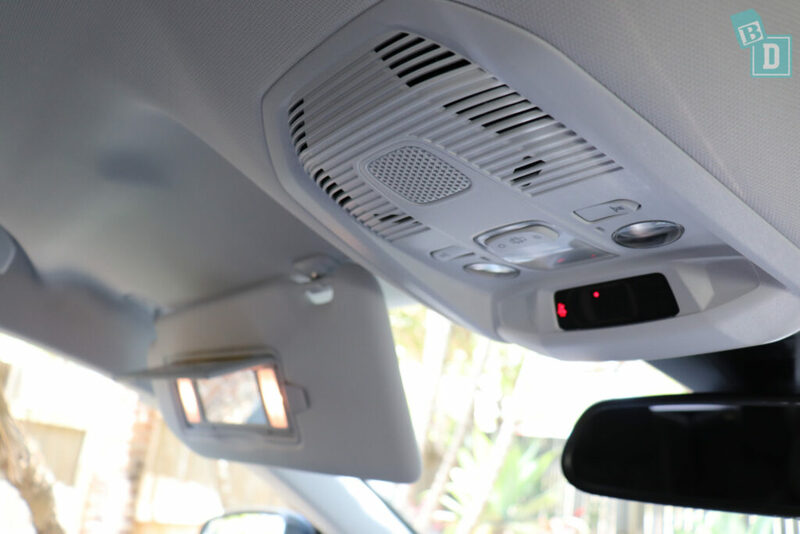 There are lit vanity mirrors in both visors in the front and the visors are not extendable and there is no glasses case in the ceiling. The interior lights in the back are centrally located in the ceiling, unfortunately too far back for me to reach from the driver's seat while driving! Also if I am traveling home and it is getting near to bed time and I DEFINITELY DON’T want her to fall asleep in the car as even a five-minute nap in the car means bed time is all over!!!! I lean back and pop the light on so it’s not dark and try to keep her awake!! Along with screaming/singing at the top of my voice!!! In the third row, they are centrally located above the boot opening. 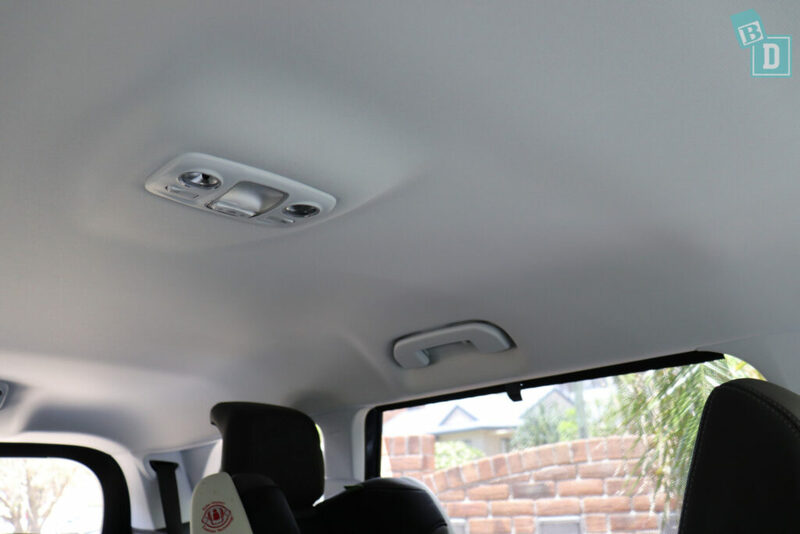 There are handles above both rear doors which are well positioned to hold a baby toy for rear-facing passengers. Visibility out of the 5008 is not amazing. It is a great looking car that feels quite squat, so the windows are not very tall! Once child seats are installed in the back it is actually quite difficult to see out of the rear window at all. Because of this, I found I relied really heavily on the cameras especially when reversing. One thing I have noticed since being a mum is I hate it when I reach a destination or get home from being out and Tulsi has either done really well in the car or she is screaming her head off and I have done really well to keep it together for the entire journey (usually the latter!!) and it takes 10 minutes to park the car! It can be really stressful. Usually I dread parking new cars as they take longer in our tight apartment block carpark, but the 5008 was simple to park as the camera views were so good! The door panels and dashboard in the Peugeot 5008 use the same houndstooth woven fabric as the seat upholstery. It looks fantastic but I will admit to being very anxious about my child even touching the upholstery and I was praying she wouldn't be sick in the ar!! As I think the seats would not be easily wiped clean and would get child spills and crumbs ingrained quite quickly. There were carpet floor mats in the model I tested. 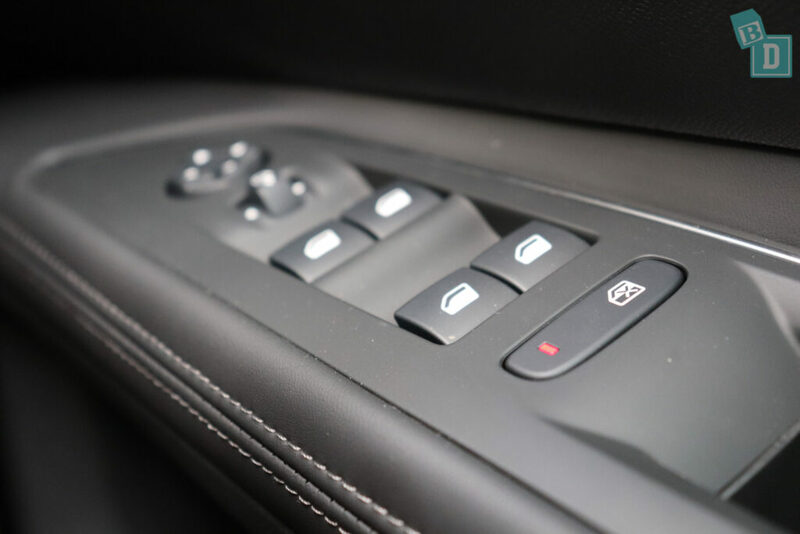 The 5008 has keyless entry and a powered tailgate which has a silent opening and closing and a lock press button function too. So… How safe is the new Peugeot 5008? 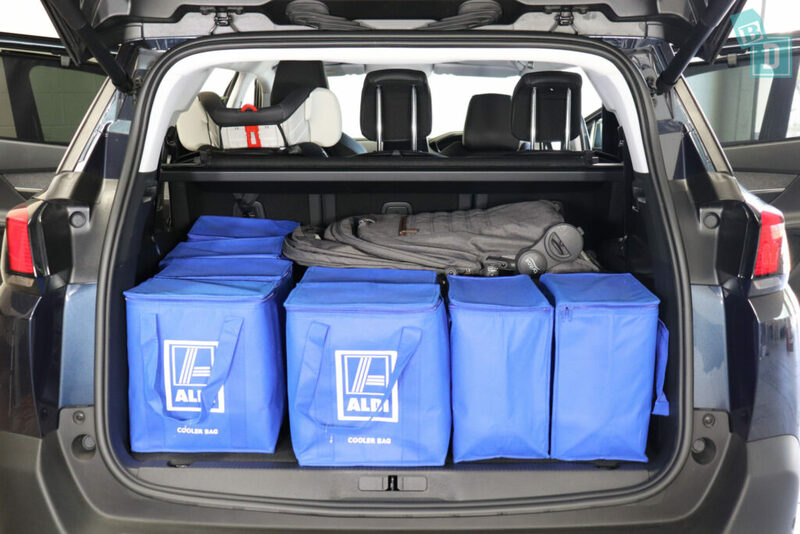 Six airbags come as standard; there are dual frontal airbags and front side airbags and curtain head airbags for all three rows of passengers. The new Peugeot 5008 scored a five-star ANCAP safety rating in 2016. Scoring 86% for adult occupant protection, 85% for child occupant protection, 67% for pedestrian protection and 58% for safety assist. During ANCAP's testing in the frontal offset test, protection of the 10-year-old dummy’s chest and neck was ADEQUATE and protection of the head was GOOD. Dummy readings indicated MARGINAL protection of the 6-year-old dummy’s chest with GOOD protection of the head and neck. GOOD protection was provided to all critical body areas of both dummies in the side impact test. The child occupant protection scored an overall 41.98 out of 49 during ANCAP testing. Broken down into 13.98/16 for the dynamic front test, 8/8 for the dynamic side test, 12/12 for restraint installation and 8/13 for onboard safety features. As standard, all models of the 5008 come with anti-lock braking system (ABS) with electronic brake-force distribution (EBFD), emergency brake assist (EBA), electronic stability control (ESC), speed limit recognition and recommendation, autonomous emergency braking (AEB), distance alert system, advanced driver attention alert, lane departure warning (LDW), active lane keeping assistance (LKA), adaptive cruise control (ACC), forward collision warning (FCW), active safety brake (with pedestrian detection), active blind spot detection, smart beam assistance, electric child locking functionality on rear windows and doors, exterior temperature indicator with ice warning, automatic locking doors and boot (activated by vehicle moving) and grip control. The top two spec models also come with self-levelling headlamps. Some of these safety features are also features that drive me crazy as a mum! Like the lane departure and forward collision alert or the parking sensor beeping sound. I want all the safety technology AND to be able to mute the sound when Tulsi’s asleep! What is AEB or Auto Emergency Braking? What is rear cross traffic alert? 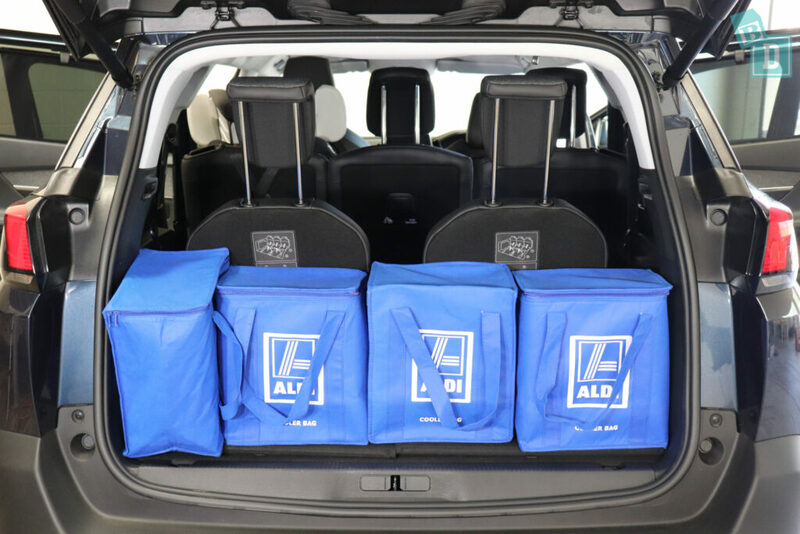 Which seven-seat SUVs can fit a twin stroller in the boot?